The arm party is over, and while we’re still fawning over the stacked-rings look, a new way to show off your jewelry-layering prowess has surfaced on fashion favorites everywhere. The multiple ear-piercing trend strikes the perfect balance between delicate (dainty studs and pearls) and tough (piercings en masse have always been a little badass, no?). Now when it comes to how to wear multiple earrings, you can take an everything-but-the-kitchen-sink approach. However, if you prefer a bit more guidance and strategy, feel free to look to the images below for inspiration. Keep scrolling for our favorite examples and to shop the prettiest pieces to pile on. We bet you’ll even be able to book a piercing appointment on the double. There isn’t really a part of the ear that you can’t adorn with an earring, so why not get creative with your placement? The asymmetry of an odd number of earrings plays up the look’s natural edginess. 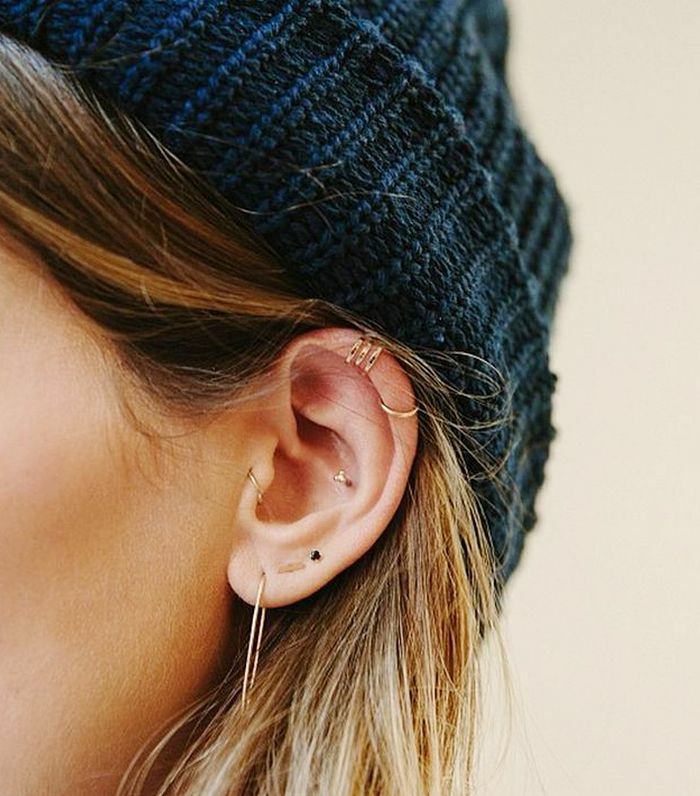 A simple helix and lobe pairing is a subtler way to get in on the trend. A feather earring is the ideal accessory for the bohemian girl. A dangling earring is a refreshing option amid multiple hoops and studs. For major impact, consider studding your ear all the way up with pearls and diamonds. Flower-shaped studs are a sweet alternative to the typical balls. While keeping all your jewelry in the same metal looks perfectly pulled together, we like the unexpected appeal of mixing gold and silver. If you haven’t heard, opals are the It gem right now. It’s all about mixing and matching delicate earrings. This pearl and bar set make an excellent pair. Add a little edge to your look with these gold and silver hoops. Try an unexpected shape like chevron to add interest to an outfit. These studs are sure to toughen up any look. These asymmetrical tusk earrings are a hit with our editors. A drop, black-stud earring adds an edgy touch. This post originally published on March 2, 2014, and has been updated.